Black Friday and Cyber Monday Deal 2018! Boost Your Sales! Black Friday is coming... The time to BOOST your SALES is coming! 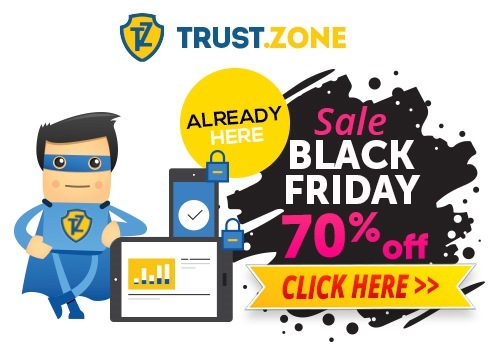 For the next 48 hours we sell Trust.Zone VPN with up to 70% OFF! 1 month of VPN is just $2.33. Share your affiliate links and EARN, EARN, EARN! No need to change your current affiliate links. Your affiliates links are OK to grab Black Friday offer. We recommend to do not use specific landing pages during Black Friday offer. Just redirect your traffic to homepage or price page of the website directly. Black Friday discount is also avaialble for the static dedicated IP addresses (streaming, Neflix, Hulu) and additional simultaneous connections too! We have the limited number of static dedicated IP addresses for the US, the UK, France and Australia. Have any questions? Feel free to contact us anytime. Winter Final Sale! Boost Your Earnings Right Now!High Earning Landing Pages are Avaialble!